In just over a week, Britons will vote on whether the UK should remain in or leave the European Union and analysts are pumping out their predictions on how a Brexit could impact Britain. The aftermath doesn’t look pretty. 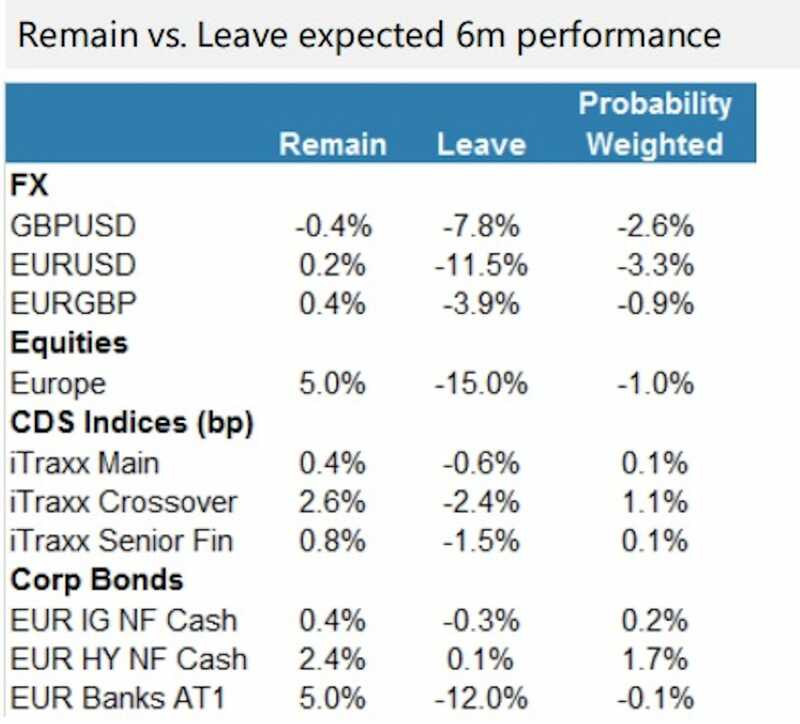 According to Jacob Nell and his team at Morgan Stanley, the impact of a Brexit on a range of financial markets within the first 6 months is quite devastating. In fact, a “Leave” vote is tipped to make equities tank by 15%. This is opposed to a 5% rise in stocks in the event of a “Remain” vote. (1) Based on that 30% probability, scenario analysis suggests a number of assets price in too little near-term referendum risk premium. (2) GBP and EUR screen particularly poorly, with large potential downside balanced with only modest gains under Remain, in our view. (3) European equities also show poor asymmetry, and we continue to prefer US stocks ahead of the vote. (4) Correlations between FX and equities could reverse for EUR. (5) EUR corporate credit has the most balanced risk/reward, aided by the start of ECB buying. (6) Don’t assume that it will be easy or obvious for the MPC to ease further in a Leave scenario. Brits vote in the EU referendum on June 23. Already, one-month sterling volatility – a measure of how much the British pound is expected to fluctuate in the coming month – has hit its highest level of all-time, as currency traders get increasingly jittery about the prospect of a Brexit. Property investors are also thought to be holding off on buying a new place in case of a Brexit while the same concerns are having a huge impact on the UK’s manufacturing industry.